Mom? Mom? Mom? Mommy? Momma? Mom? Seriously? What do you want? You know I’m not telling you until we get in the car. Otherwise you pester me all day about it. Are we going to the lake? Are we going to drive race cars? Are we going to blow something up? Are we going to meet an evil scientist and watch him blow stuff up? Are we going to go to a castle and there’ll be an EPIC BATTLE and a dragon? Yup. Castle, swords, whole deal. Mom…..you’re such a liar. There aren’t castles here. 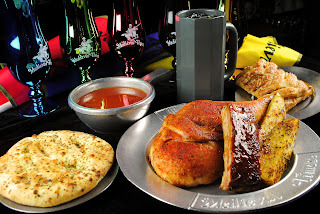 Medieval Times is a dinner and tournament experience. When you arrive, you enter and are assigned to a knight. You get a crown (yes, even you, mommy) in the appropriate color, and then you get to wander the “Great Hall” and see the sights while you wait for the actual dinner seating to begin. The night we went, there was a falconer and Princess Catalina out for you to take pictures with as a family. I’m not gonna lie, it took me a second to get over people saying “M’lord, m’lady, this way, please.” with a totally straight face. During the period while you wait before the seating, the king comes out and acknowledges birthdays, anniversaries, and other special events. We arrived much earlier than we needed to since we didn’t have a special event, but there is an open bar and the kids enjoyed the “knightings”. Once it’s time to be seated, guests are invited to enter by the color of their crown. 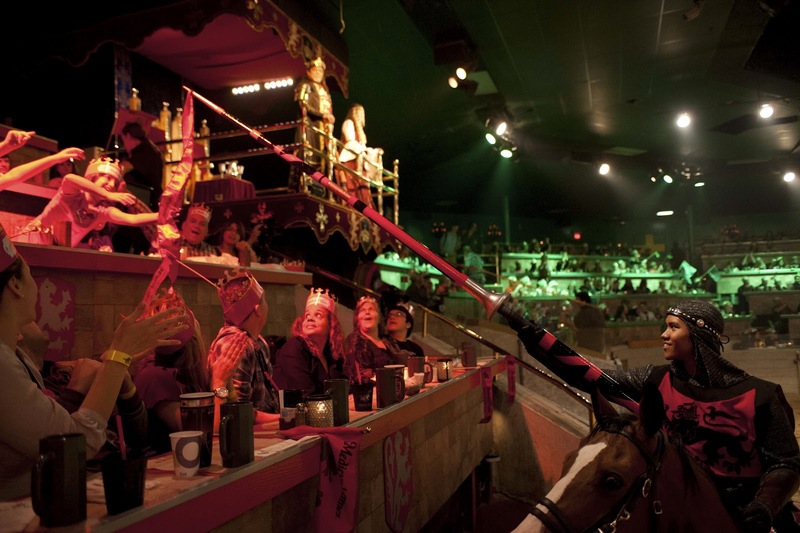 You’re seated with the other guests who will be cheering for your knight, and receive a ribbon to wave, too. 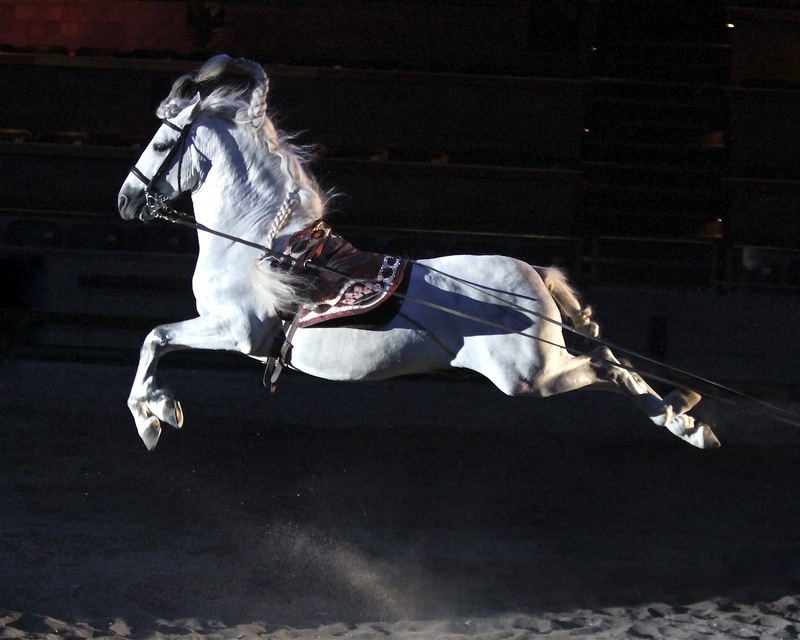 The new show, which we were able to see, starts with horses, who perform very beautifully. There is a good bit of Fog Machine that happens during the show, as well as periods of lasers and/or darkness. None of my children were frightened by this, though, they actually enjoyed it! The show isn’t “too loud” (I know I’ve had several readers write to ask about volume of performances) but you are seated stadium-style, so don’t plan on having conversation with anyone who isn’t seated directly next to you. 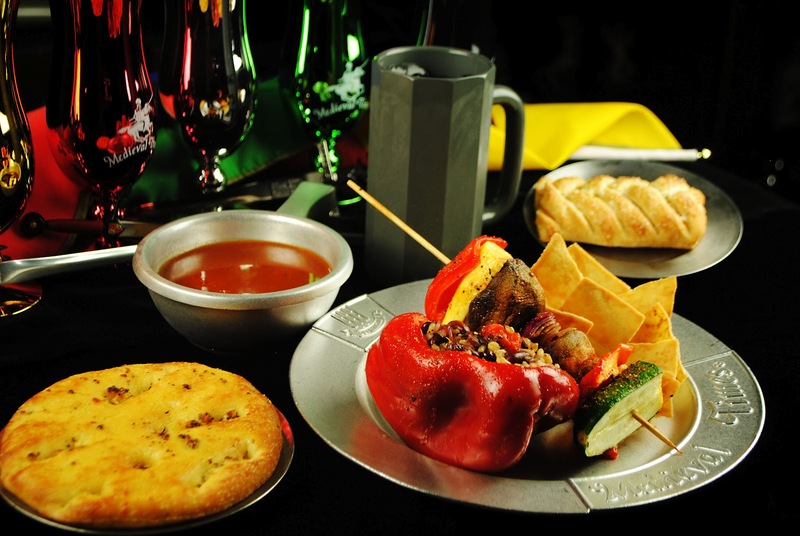 The premise of the meal is that audience are guests of the king and his daughter. To entertain his guests, he has invited a knight from each area to compete. Then there are some exhibitions of either horsemanship or falconry and games of skill where the knights ride on horseback and compete in things like spearing rings with their lance. Winners are given flowers by the Princess, which they toss out to people in their section. Dinner comes in kind of a strange progression of courses. First there’s tomato bisque, and then after that there’s a garlic bread course. I’ve never had a bread course before, but whatever, it works! The main meal is INTENSE. There’s half a chicken, 2 ribs, and potato wedges. You should know, too, that you eat without silverware. You get a lovely thick napkin, though, and after dessert (ours was an apple pastry) you get some excellent wet naps 🙂 If you have children young enough, they can be a lap child. We did this, but I would NEVER do it again. It would totally be worth the extra ticket not to have a crown and banner in your face the entire time, and to not have little fingers in your food (lap children share a meal, which is fine because the portions are enormous, but not fine because there are little fingers in your food!) Spring for the extra ticket so that you can keep your eyes in tact! If I wasn’t sharing with a little carnivore, I would have opted for the vegetarian meal, which they do offer. It appeared to be a grilled mushroom cap, hummus and pita and a veggie kabob and actually looked really good! You should know about the meal that your drink options are unsweetened iced tea (sugar/artificial sweetener is provided) and Pepsi. 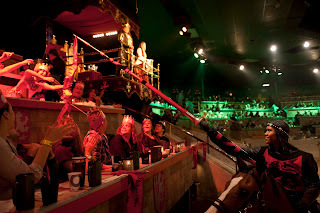 The show progresses during dinner to a man-to-man competition where the knights face off jousting and then in foot battle. They actually joust. This amazed me. I hadn’t figured out how they were going to fake that, and they don’t. They actually ride on horses and slam each other’s shields with lances that shatter into a million pieces. They do fight and simulate someone being cut or stabbed, but there is no blood and it is “real” enough to be interesting and exciting and “staged” enough that my youngest understood there was nothing scary. “It’s like big brothers playing swords” was her comment, and she’s easily upset about things. There is a villain who comes to try to claim Princess Catalina, and there is some ominous music. Some of the swords shoot sparks. We happened to think both of those things were awesome. Note: The New Show is on sale for a limited time. Also, there are matinee educational shows, but I haven’t seen one. I hear they are not much different from the evening performances, but cannot speak to that with any authority. Recommended for ages 5 and up, although younger children will enjoy it, too! Pros: Different experience, highly imaginative and engaging. Kids enjoyed the atmosphere and the food. Fun costumes, and an overall unique and really upbeat experience! Cons: Fog and lighting could intimidate the youngest viewers, or those who are sensitive to sensory overload. Notes: This show includes imitations of fighting, as well as the use of animals. We had a great time at Medieval Times, and we think you will, too!! 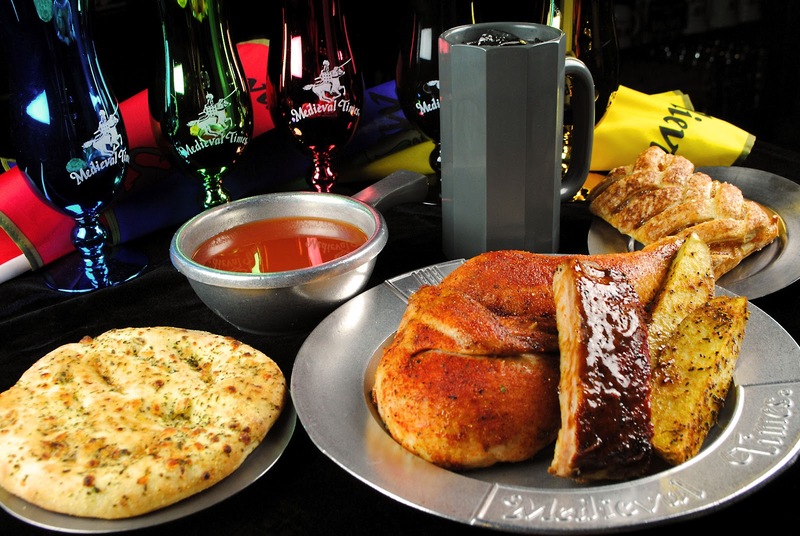 Enter from now through April 19th at midnight to win tickets to see the new show for yourself at Medieval Times Baltimore! 2) Facebook! 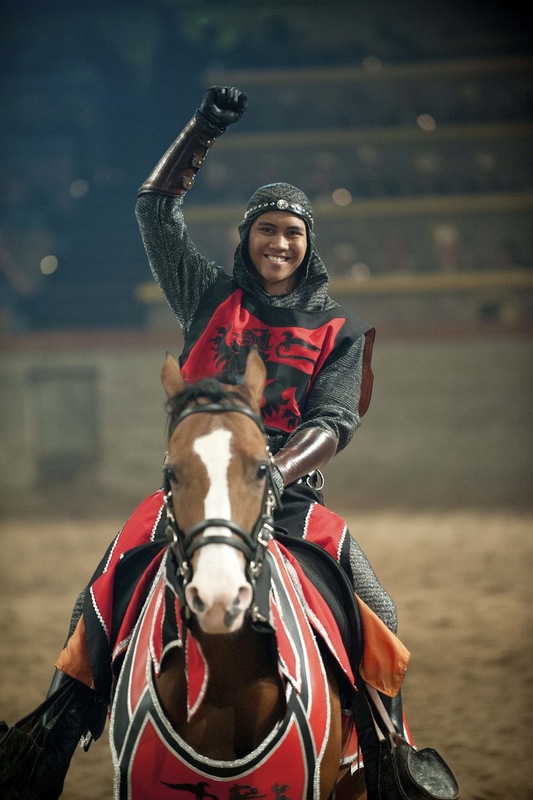 You’ll have to post here, too, but head to Medieval Times Maryland and let them know PwcMoms sent you! Your comment here stating you did this is your entry, as always. 3) Share! Tell your friends about this contest on facebook or twitter and link back to @PwcMoms and leave a comment saying you did. 4) Or just leave a comment. I forgot this one originally, but you can always leave comments. They’re my favorite. Disclosure: PwcMoms was provided with tickets to attend a Medieval Times show, as well as a set of tickets to give away. No other compensation was provided and all opinions expressed here are our own. Your experience may vary. We’re not responsible for you being lanced. Just sayin.